TripAdvisor is an online travel booking website that focuses on a community of consumer reviews to help you choose the best trip package. For every deeply discounted resort package or hotel stay on the website, you’ll find a bevy of reviews from previous travelers that will help you decide if the savings is worth it. We all know and understand how online reviews work, meaning we’re all aware that many reviews can be faked or are just the result of an unpleasant person’s bad day. For this reason, TripAdvisor employs a team of people with backgrounds in things like credit card and insurance fraud, who specifically comb reviews looking for fakes. As much as they can, they guarantee that the reviews you’re reading are real and honest. While TripAdvisor does have booking and searching capabilities for flights, hotels, and vacation rental packages, the main focus is on the community of reviewers. Reviews are not posted instantly; instead, TripAdvisor sends them through a verification process where they check for fraudulent reviews. They blacklist any hotel or airline that posts fake reviews or bribes their customers to do so. In this way, you can be reasonably sure that you’re reading real, honest reviews of hotels, flights, resorts, and other vacation packages. One of the best things about TripAdvisor is the “Things to Do” section, where users recommend those hidden local gems that may be hard for the average user to find. There’s even a comprehensive tag system, where users can make it even easier for future travelers to search by features, such as “serves brunch” or “delivers”. As TripAdvisor far outstrips review websites like Yelp for travelers, there are constant reports of hotels and resorts offering guests reduced prices in exchange for better reviews. Controversy frequently surrounds the verification process for reviews, and there have been several court proceedings throughout the years regarding this feature. While you can search for hotels, flights, and other vacation rentals through TripAdvisor, you’ll be re-routed to Priceline to do the actual booking. 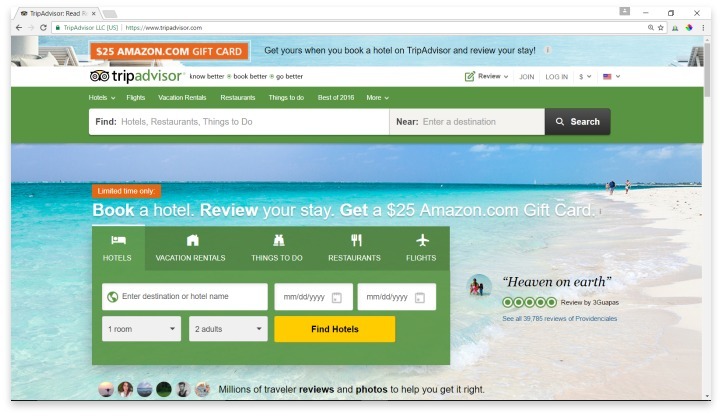 The tag system from the reviews makes it easy to search, though, so if you don’t mind the two-step process, you may want to do your searching on TripAdvisor. Another cool feature offered by TripAdvisor is a pre-made itinerary that you can print, curated by local employees who know all the best places for any type of traveler. If you have to be in a certain area for business, or you just want to get a feel for some local flavor, you can follow along with one of these pre-planned trips, taking all the guess work out of it for you. It’s almost like having your own tour guide for any area you want to visit. TripAdvisor is an online travel booking website that focuses on a community of consumer reviews to help you choose the best trip package. 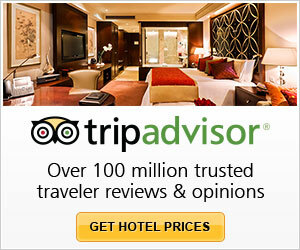 For savvy shoppers who rely on reviews for comparison, TripAdvisor is a great place to start. As with any online review system, it’s best to use your own common sense and decide what looks like an honest review to you. Watch for common threads throughout all reviews to get the truth about a location. The excellent tagging system makes searching more intuitive than other booking websites, which may make up for the re-direction to outside websites for booking. Have you had an experience with this company? Please share your TripAdvisor reviews below. Been years since I used them but their review of the motel I stayed at was spot on.